The USB-WLAN 11n is an attractive plug-and-play solution that lets you wirelessly surf the net and transfer data within your home network at ultra-fast speeds. ultra-fast wireless data transfer at up to 300 Mbps (compatible with ieee 802.11b/g, IEEE 802.11n Draft 2 Standard – Hardware already standard-compliant software will be standardcompliant with future software update. 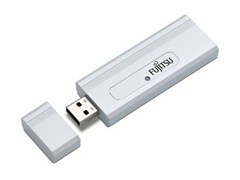 If need latest driver for Fujitsu USB-WLAN 11n adapter, Please try the generic driver for Ralink RT2870 series USB Wireless LAN Card.